Today's bento was inspired by Chinese paper cutting and the pattern was copied from one of the Chinese paper cut for year of the Rabbit. Instead of red paper, I used red egg sheet and my X-acto knife to cut the pattern. I couldn't use the same spot as usual to take the picture and this picture was taken in the kitchen, and it came out a little bit dark and I lost the details on the rabbit's body *sigh*. Inside the box : tiny oranges, char siu pork, and stir fry veggies (green beans, yellow beans, carrots). Today, I feel a lot of better from my cough. Try to eat healthy, drink a lot of water and still avoid to use antibiotic to recover. I'm glad that the kids are healthy, hope they will not catch the same bugs as me. The weather has been crazy from the weekend, like one hour was so hot and the next our was rainy ... it changed every hour. This year, I won't host the Chinese New Year celebration at my house. We haven't decided yet where will be the place to celebrate with the whole family. I think will be either at my parents' house or in a restaurant. I baked some pineapple tarts with my mom and my sister last week, and the tarts were almost gone even before the celebration started :) Hope everyone has a great week ahead! So so pretty and traditional, I really love it!! Looks like painstaking cutting and work here. So gorgeous Lia. I wish we had 2 or even 1 week off for Chinese new year. So glad to hear your cough is getting better and you're feeling better. Yay! This is amazing work..very detailed! ckckck... kagum beneran ini mah euy... rapih, apik bener..
Ikutan seneng kalo Lia sudah mendingan, soalnya udah mau sin cia kan ya..
Ini serumah sekarang lagi batuk nih, termasuk pembantu, kyknya beneran lg musim bgt ya.. I love your papercut Lia! I was hoping to do papercut too! But not nearly as ambitious as this one. I would use a tiny radish, heh! Glad you are feeling better just in time for CNY! Happy Chinese New Year ... what a great bento!!! 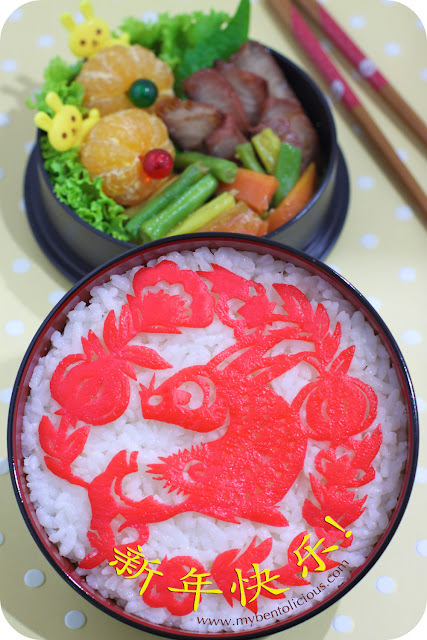 I can never make such pattern with my X-acto knife *seriously* ... you're such a great bento artist. Hi Lia! So glad you are feeling better, hope its 100% soon!! Ah, what beautiful and intricate bento art you've shared here. The wonderful vivid red and harmonious rabbit design are so special--truly unique! Happy Lunar New Year Lia!! Im available on blogspot now. @Steph : Thanks a lot Steph for your kind comment! Lia, this is totally amazing! I cannot believe you hand cut the whole thing, it is simply beautiful. @Shannon : Thanks a lot Shannon! @Tifanny Yang : Thanks a lot Tifanny! I was stun by your CNY egg sheet cutting. U are realli good at this :) Wish you and your family a Happy Chinese Luna New Year. Simply amazing work Lia! Happy Chinese New Year! @Sneige : Thanks a lot!